The two Chinese zodiac signs of the tiger and the horse in love make a good couple because of their similar personalities. Both of them are bright, positive, and fun. They will enjoy going out together whether they are friends, in a romantic relationship, or in a business relationship. The tiger and the horse relationship can be good because they share comparable goals and interests. Both these Chinese zodiac signs require independence. Because of this, their relationship will be original and free. The tiger and horse love compatibility will be excellent in this relationship. They are both are sociable and exciting. The tiger tends to have more strength and will drive their relationship. They admire the horse’s spirit. The horse likes the tiger’s impulsive and self sufficient nature. Both the tiger and the horse have similar personalities. They are both lively, energetic, and intense. The horse’s energetic nature is appealing to the tiger. At the same time, the tiger’s bright and confident nature is appealing to the horse. The horse is very good with money. They will typically share the same goals. The both have good humor and a lot of respect for each other. They can be very intimate with each other. They will have an exciting relationship. In bed, the tiger and horse sexually make the best partners. The tiger and the horse both have active social lives. Both will perform charity work. They both want to increase their group of friends and contacts. The tiger man and woman might seem to be the dominant one in the relationship as he or she likes to control situations and is a natural leader. They have a brave spirit. They appreciates the horse’s clever wit. The tiger and horse marriage too will be romantic and content. However, that feeling might not last long. The horse is fickle and will put everything they have into new relationship. However, their mind changes very easily. The tiger has a sense of nobility and a kind nature. Because of this, they will be more reliable in this Tiger Horse friendship. At the same time, the horse is energetic and self sufficient and does not follow other people. They are restless. They do not like having to meet other people’s expectations. But even then the breakup of the Tiger and Horse match is unimaginable. Because of this, the horse man or horse woman will likely leave if they feel they are being pushed to settle down. The tiger too is somewhat restless. Because of this, the tiger male and female horse both accept that each other will want to do things a certain way. The female tiger and the male horse both will understand that each other want to be able to go where they want and do what they want. A tiger wife and horse husband are an ideal couple. They will work well together. The horse will make the tiger wife feel secure and they will have a strong bond. A tiger husband and horse wife will want to spend time together. 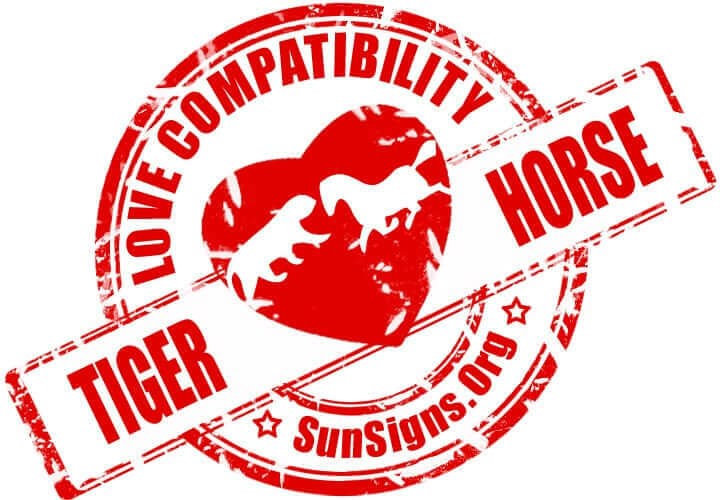 The tiger and the horse soulmates will make a good couple predicts Chinese horoscope compatibility analysis. Tiger & Horse Chinese Horoscope Compatibility Rated 5 Hearts!